Why is packing so stressful? I actually love the challenge, but the number one question I get asked from students and readers is "what should I pack for my summer/semester/vacation abroad?" This question is as impossible to answer as my other least favorite question, "how much should I budget?" Both answers depend entirely on the individual. I can, however, give this piece of advice - pack half of what you think you need and double your spending money! But seriously, I get it. Packing for a trip abroad is difficult, especially if you've never been abroad and don't know exactly what to expect culturally or weather-wise. My experience speaks mostly to Italy and Europe, but you could certainly follow this advice for other destinations. Research your destination's average weather conditions. Is it rainy? Hot? Cold? You also want to check for cultural expectations/restrictions regarding clothing. For example, to visit churches in Italy you need to cover your shoulders and, in many cases, skirts need to hit the knee (no shorts!). Lay out the clothing you want to pack. This will help you identify items you might be missing. Compare your laid-out wardrobe to your itinerary and make sure the items you have selected are functional for your trip. You also want to focus on items that you can mix and match. Finally, once you have a good idea of the articles of clothing you want to bring (or need to get), start selecting shoes. Make sure they are comfortable and functional, not just stylish. Your goal is to identify a limited number of shoes that you have (or need to purchase) that will go with every thing you pack (the same is true for purses) and work for every activity on your itinerary. If you really want to be an expert packer, I suggest taking the time to photograph each item and/or outfit. That way you can see exactly how you can mix and match and how many outfits you can make from what you have packed. It also helps you identity less-functional or versatile items. By doing this a month before you depart, you have enough time to pick up any articles of clothing or shoes you might need (and the necessary time to break those shoes in!). I like to do a dry run pack about 2 weeks prior to departure. This ensures that everything you want to bring will fit in your luggage and make sure your bag isn't over weight (here are my tricks for dropping your bag's weight). By doing this two weeks before, you have the time to rethink or reduce the number of items you've packed if need be. Trust me, this is not something you want to stress over the night before departure. I also recommend investing in some packing cubes, which you can read more about here. Use your last week before you depart to make sure everything you are packing is washed and ready to go. I like to slowly add everything to my bag that week, rather than marathon it the night before. It is also a good idea to make a list of everything you want to pack and cross off each item as you go (you can read my carry-on packing list here and an example of how I pack my carry on here). Leave this list at home in case anything happens to your bag and you need a record of everything you packed for your insurance company or airline. You also want to check the weather one last time to ensure you are prepared. 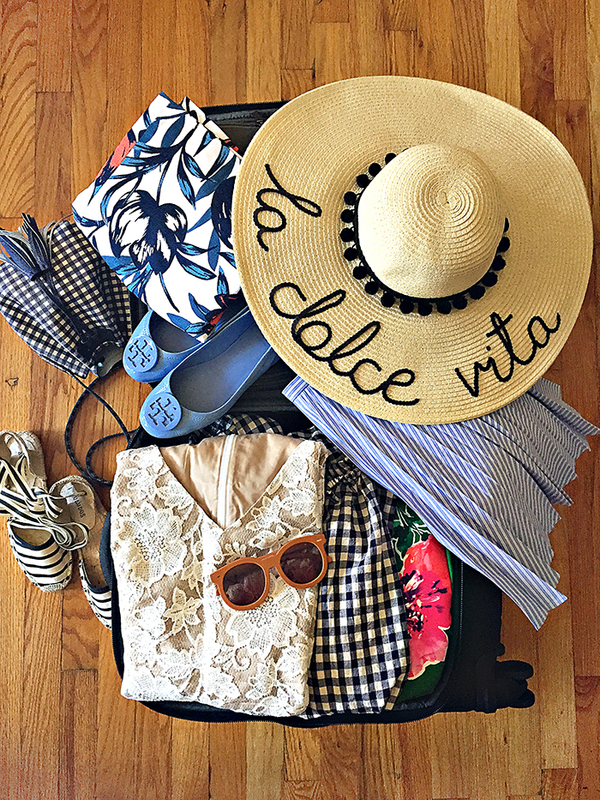 Click here for an example of a summer in Europe packing capsule. Buon viaggio! And please leave any questions or tips below if you have them.